I first met Vel Miller at the Paso Robles Festival of the Arts in May, 2012. The park was an overwhelming exhibit area and I was trying to see everything in the park and at Studios on the Park. Across the street at the same time, Phantom Project 2, the largest indoor exhibit to hit Paso Robles, was at the end of its exhibit period. I had managed to see that a few times before the Art Festival started. In the midst of all that was happening, it's amazing I even discovered Vel Miller's exhibit. I'm so glad I did. Vel Miller's tags on her art read "Western Interpretations." She is interested in creating art that people will connect to emotionally, as well as aesthetically. The booth pictured above is part of her 2012 display. In my more thorough article, A Walk Through the Festival of the Arts, 2012, I have a video of the sights and sounds of the festival. One of the scenes in it is a quick look at some individual pieces in the Vel Miller exhibit that shows them a bit more clearly and features some I didn't here. 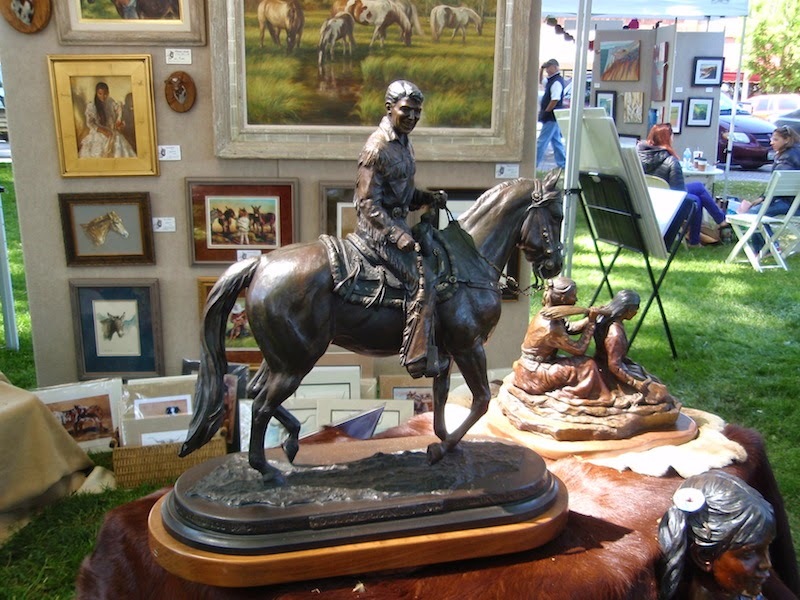 Vel has created many works featuring horses and Native Americans, as you can see in these photos. She has won over 40 awards for her work. She has also taught oil painting for ten years. Her work is displayed in museums and galleries in many countries. 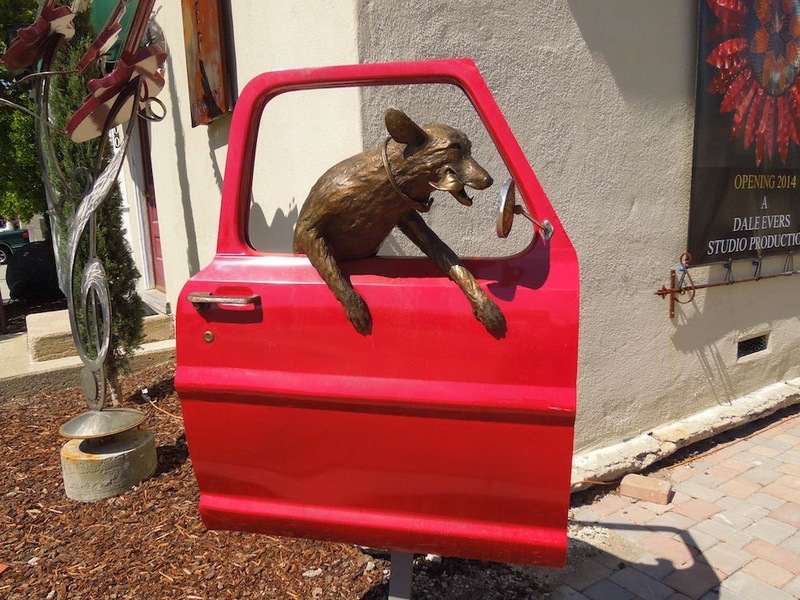 Therefore, it's no surprise to me that when the City of Paso Robles wanted a special monument in front of the Police Department, in 2000 it commissioned Vel Miller to create it. 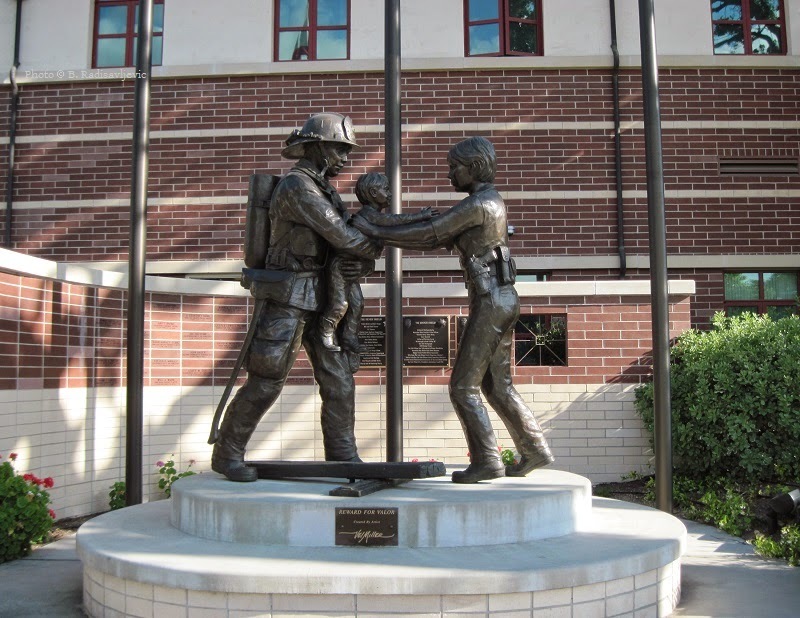 "Reward for Valor" shows a fire fighter handing a baby to a police woman. 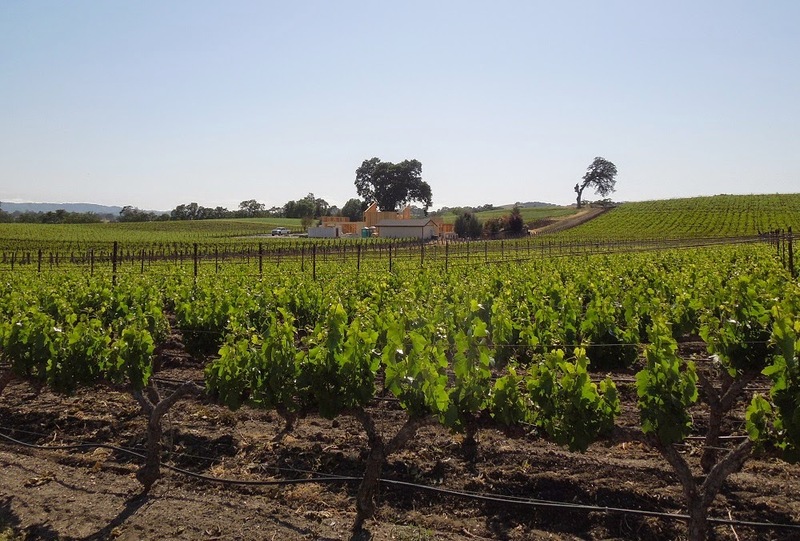 It now belongs to all of us in Paso Robles, and it's there for all visitors to the city to enjoy. Find it on 10th Street, near the corner of Park. 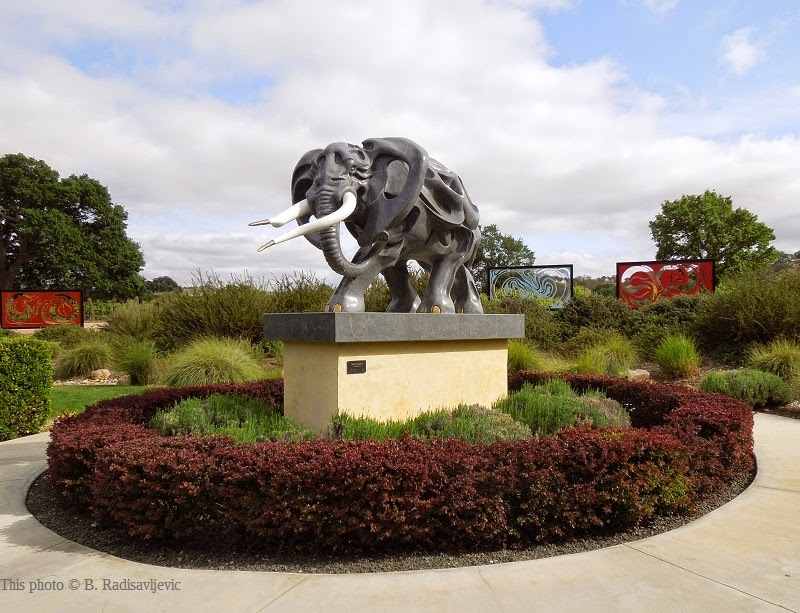 Next time you are in Paso Robles downtown, pause and take a good look at it. 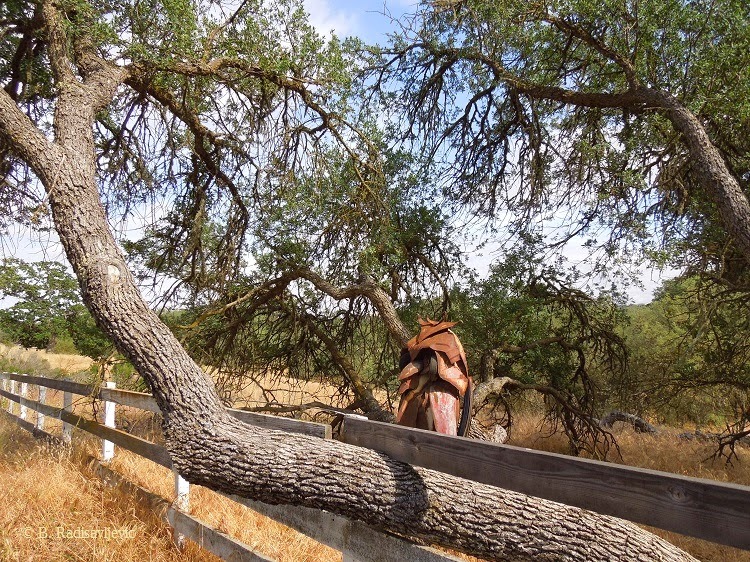 See more of the Paso Robles Art Scene on my Pinerest Board. Just click below. Follow Barbara Radisavljevic's board Paso Robles Art Scene on Pinterest. I'm always sad when I walk by abandoned businesses. I can only hope they will be sold to someone who will bring them to life again. That is especially true of restaurants. I had always wanted to try Wilson's, but it closed at three in the afternoon, and I rarely was free to go out that early. It's too late now. In 2013, at some point after I heard Wilson's had closed, I decided to go take a photo of the closed restaurant at the corner of 28th and Spring. I have a thing about wanting to document the history of downtown as it happens. For many people, Wilson's is part of that history. I took these photos in March, 2013. I went by again today after finding a listing at this address for Wilson's in the current Yellow Pages and I wanted to double check before publishing this. It is still closed and there is now a for sale sign on this sign. 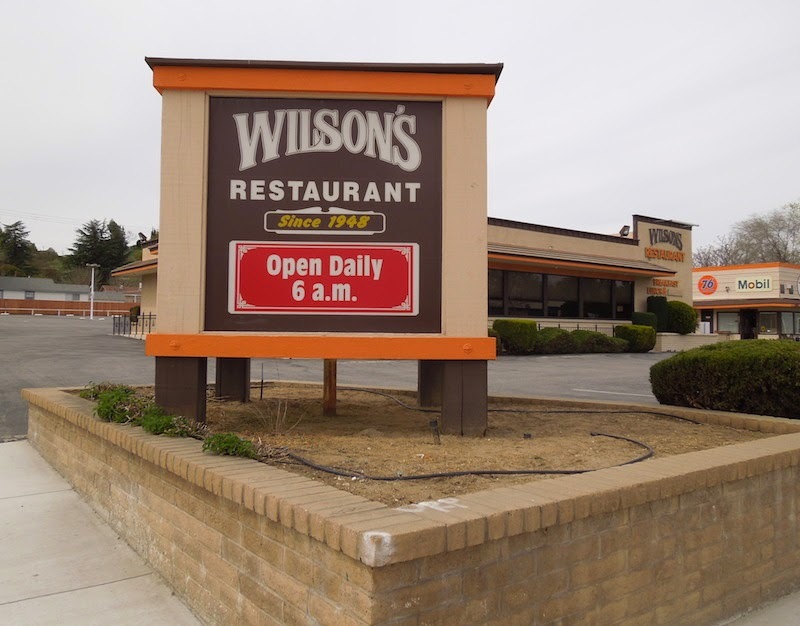 Have you ever eaten at Wilson's? 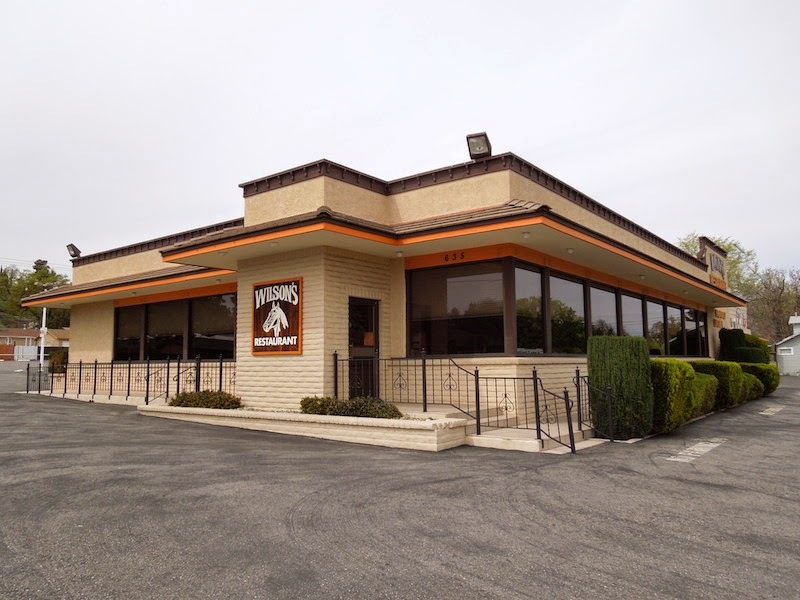 Have any of your favorite restaurants gone out of business? One thing I have noticed for years is that weed abatement does not happen at Larry Moore Park. Besides the fire hazard this can be, it can also make the park hard to use as intended. This bench is one example of that. I took this picture on March 26, 2011, a year when there was a lot of rain and the river almost flooded. Hard to believe now when we haven't seen water in the river for two years, but that year it came almost up to the water's edge near the fence you see below. As I walked to the bench to take the above picture, the poison hemlock and prickly milk thistle were up to my calves and I had be be very careful not to get scratched. It was so high, as you can see, the poison hemlock grew right through the seat of the bench. That bench is not on the ground as it appears to be. Its seat is at normal height for park benches. Who would want to walk over to that bench to sit and look at the river? This year I walked past the same bench in February, and we had had a bit of rain by then. 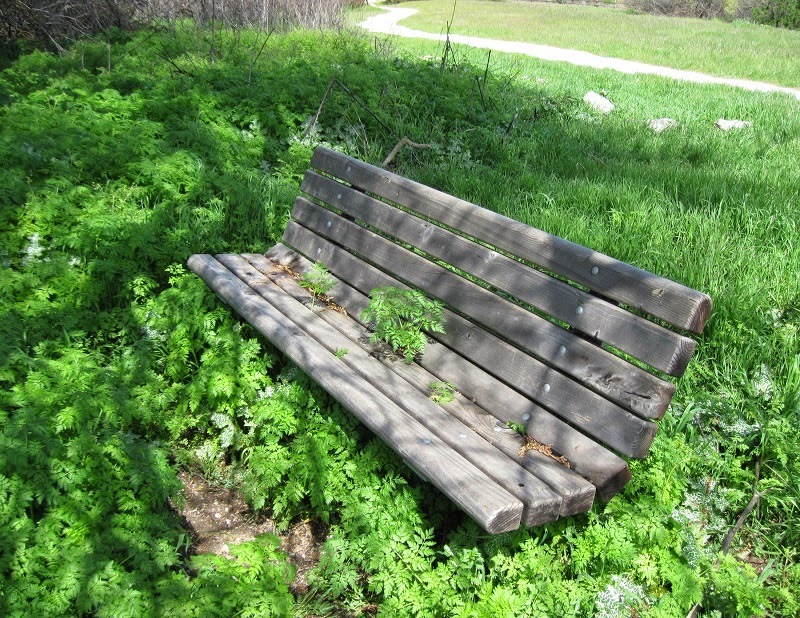 Fortunately the poison hemlock and thistles had not taken over near the bench yet, and I'm hoping the high grass around the bench will discourage the other weeds from surrounding it. Unfortunately, in other parts of the park, along the paths, the poison hemlock is growing over my head, though most is only waist high. Closer to the riverbed on the south end of the park, there is poison oak next to the last access path to the river. One has to be careful what one touches there. I'm not sure if the city just wants to keep the park wild for the sake of maintaining a wilderness area or if they are just not willing to spend maintenance money. Weeds are everywhere but the ball diamond and the paths themselves. Maybe the city just can't afford weed abatement and the hauling away of dead tree branches in the middle of the park as they fall from trees. I suspect the city gets grant funds to build the parks and trails, but not to maintain them. 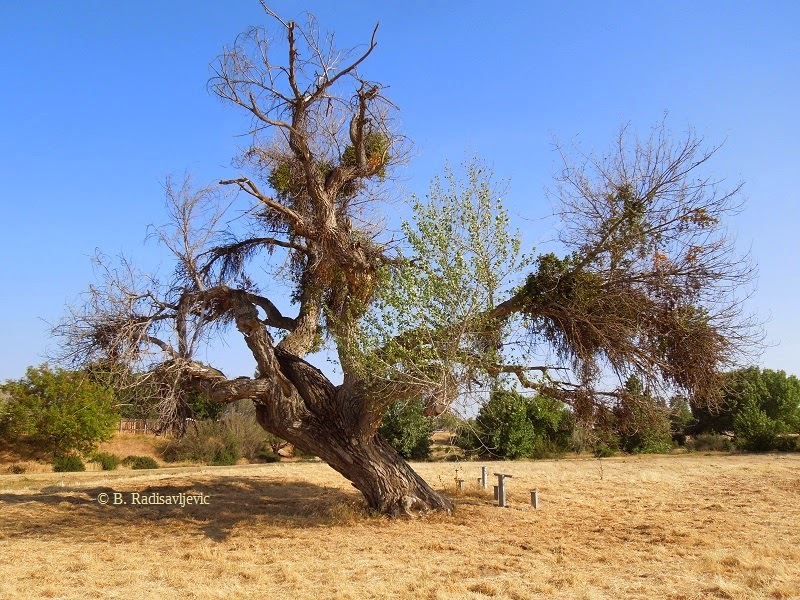 Meanwhile those walking through the park just have to be aware of the poison weeds and hope lightning or smokers never set the dead wood by the river ablaze. If the park catches fire some dry season, the nearby residents will need gas masks to protect their lungs from burning poisonous plants. Poisonous plants are everywhere in the North County. It pays to be able to recognize them and understand what they do. If you want a delightful read on this subject, try Amy Stewart's book below. She is an amazing writer and I've read this book and a couple of her gardening books, as well, and loved them. Wicked Plants is not a field guide, though. That's why I've suggested a highly rated field guide to poisonous plants as a supplement to it. Treat yourself to one or both today. If there's one thing I've learned, it's that having a good set of reference books around when you need them is very helpful. This is one more of John Jagger's sculptures I meant to include this at the end of yesterday's post, but I guess I was so tired I just forgot and I didn't notice it until I got up this morning. 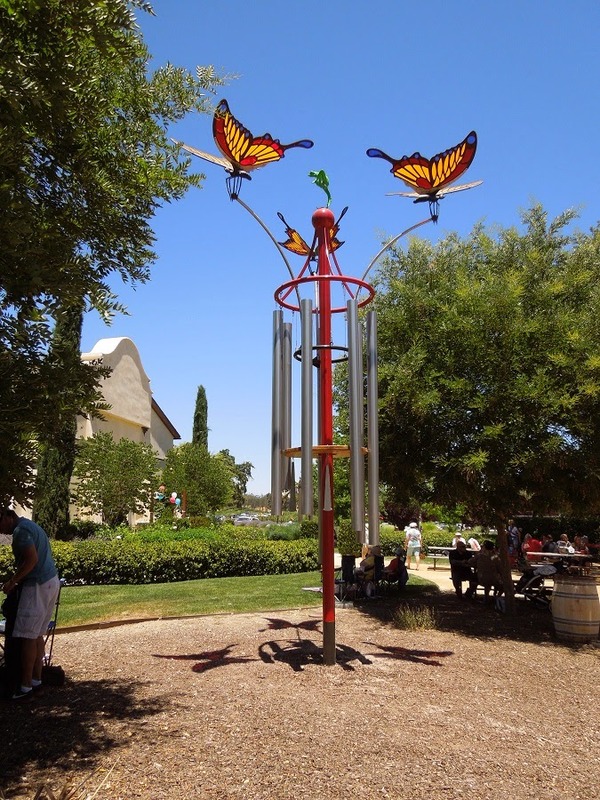 It's one of my favorites and is in the part of the Sculpture Garden behind the tasting room. The colorful landscape panels in the background are something new I haven't seen in previous visits. They were created by Douglas Tharalson. There are four in the set. They can be purchased as a set or as single pieces. Here's a closer look at two of them. 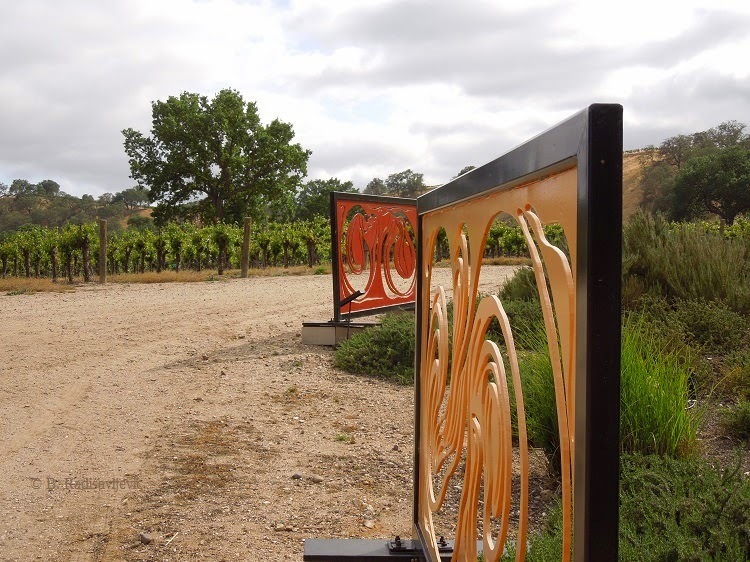 Sculpterra Winery is known not only for its wine, but also for its art. 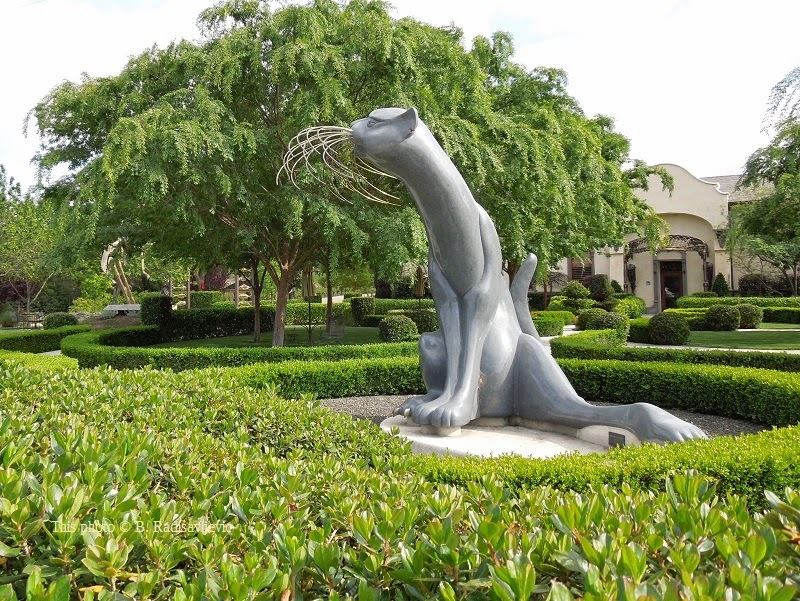 As you enter from the parking lot you are greeted by this big cat sculpture, "Golden Morning," by John Jagger. 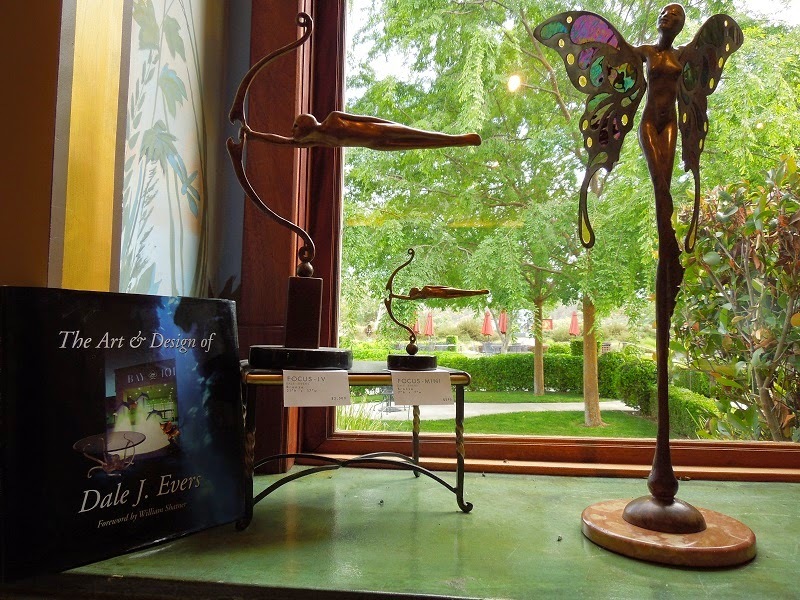 As you enter the garden, you see even more sculptures by John Jagger, and some newer ones by the new resident artist, Dale Evers. Not only does Sculpterra feature these impressive large sculptures in its outdoor sculpture garden, but you can find smaller replicas of some of them inside for purchase in the tasting room. This display in the window show some of Dale Evers' work for sale. John Jagger's work is displayed in other parts of the tasting room. 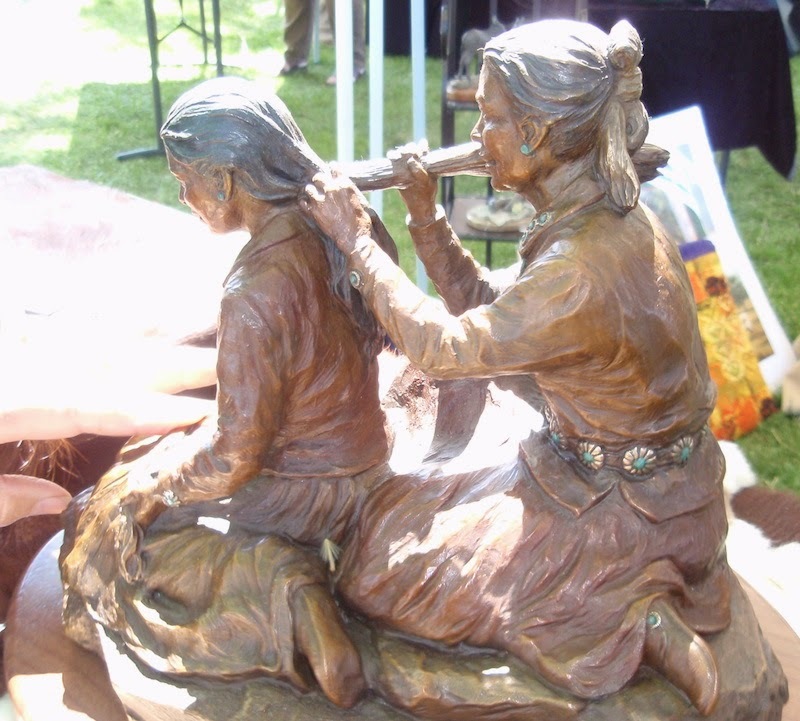 Art on display at Sculpterra is not limited to sculpture. Each month there is a wall devoted to a visiting artist. The Artist of the Month for April, 2015, is Jack Oliver and you can see most of his wall display here. 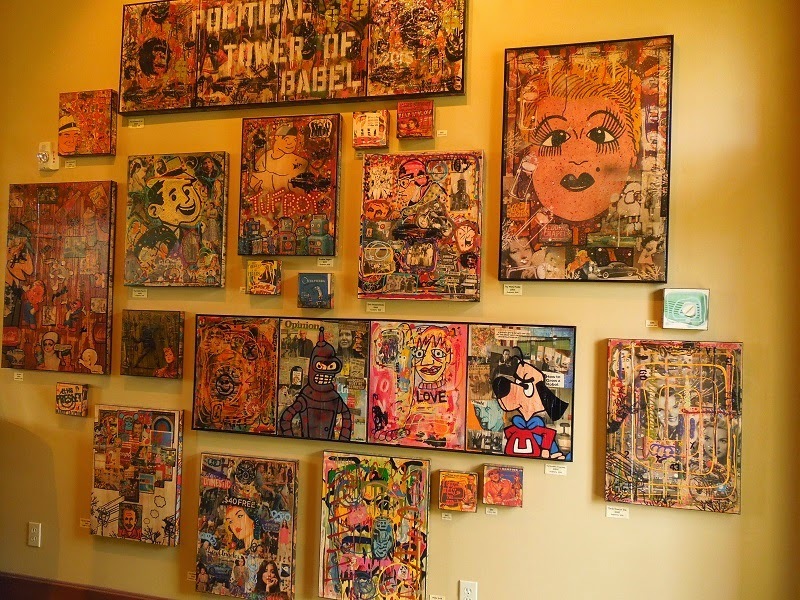 The work of other artists using different media can be seen throughout the tasting room. If you enjoy art or giving art gifts, you are sure to find something unique there as you are enjoying your wine. Find more photos and a video tour of Sculpterra. This book features beautiful color photographs of Sculpterra and other spectacular central coast wineries. I first saw it at the Lavender Festival one year at the Sculpterra booth, and that's how I decided I wanted to pay Sculpterra a visit. This cottonwood tree has been important to me since I first started walking in Larry Moore Park years ago - at least ten years ago. I have seen teens climb this tree, and, yes, I even saw a small dog climb this tree. But I'm afraid that one day it will share the fate of trees closer to the river and completely die. As you can see, only one section of the tree is still alive -- the bright green section in the center of this photo. In this photo o the right, you can see the one branch that still seems to be healthy and putting forth new shoots. I took this shot from a different position so I could get a closer look at it. 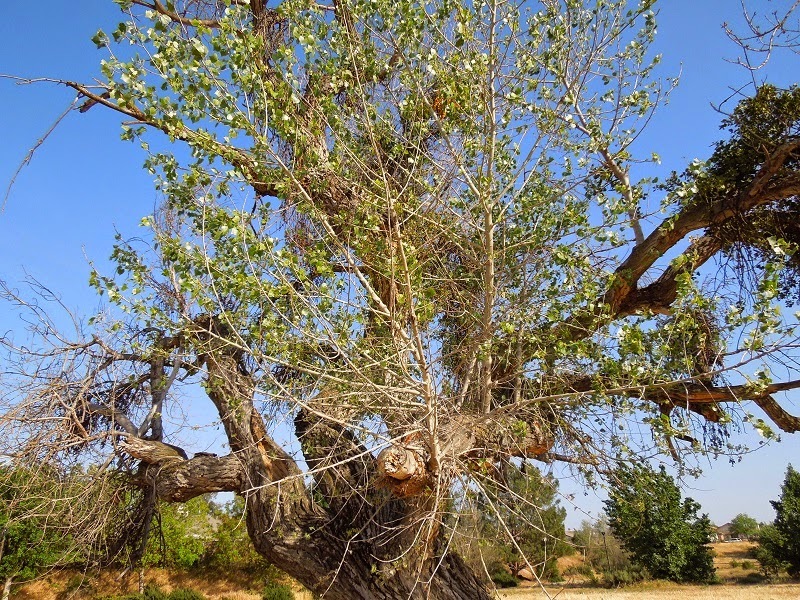 Unfortunately this tree is the victim of drought and mistletoe. The cottonwood trees right next to the river are still fairly healthy because their roots can reach deep and get water. But the mistletoe appears to be sucking all the nutrients from this poor tree. It lost a large branch a couple of years ago in a storm. 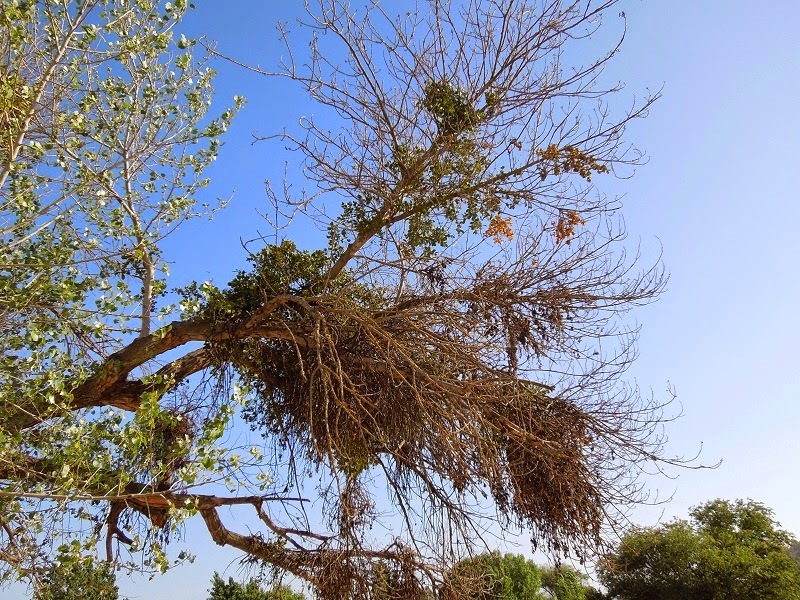 This last shot gives you a closer look at the deadly mistletoe at the end of one branch. It's the largest clump, but you can see in the top photo that it's not the only clump. Except for this branch with new leaves, all the rest of the green on the tree is the mistletoe that's killing it. We have mistletoe on most large trees in our county, and many are also adorned in Spanish moss. Do you have either of these growing on trees where you live? It was cold and windy today, but I went to Larry Moore Park to walk in spite of the weather. The wind tried to blow my hat off but it was tied to my neck. It blew off my head anyway, so it hung around my neck. I decided to turn back. It just wasn't fun anymore, and it was hard to take pictures of the plants when the wind kept moving them. Because my knee is still giving me trouble I had driven to the park instead of walking. I took the way home past my mailbox with the intent of picking up my mail. As I parked, I saw a kitty perched between the slats of this broken fence. 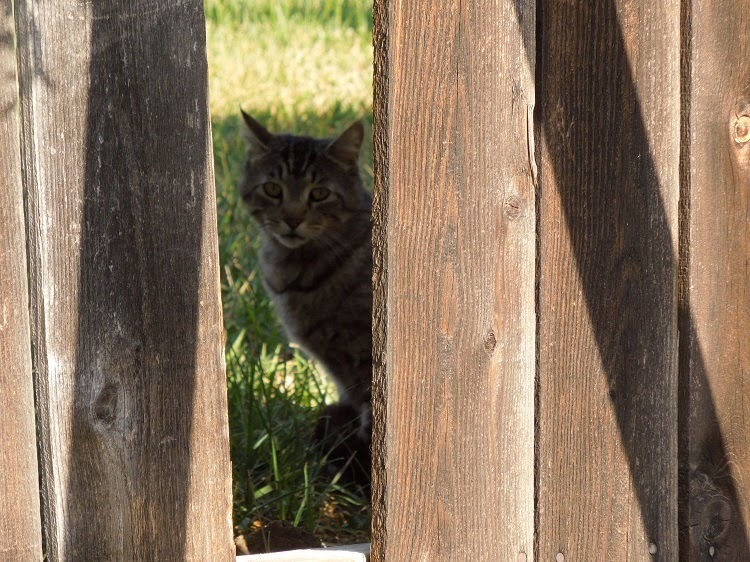 It would have made an ideal shot, but as I expected, the cat went back behind the fence when I opened the car door. I know that although kitties are shy, they are also curious. I was relying on that when I looked through the slats at an angle. It's not exactly the picture I was hoping for, but I'm happy with it. I'm glad the cat stayed close to the fence instead of running out of sight to hide. I have a lot of cats in my neighborhood. Some are more friendly than others. I got acquainted with this cat when he came to visit me every night while I worked in the garden. He enjoyed getting drunk on my cat mint. This is my favorite photo of Logan, who loves to pose for me. He is looking intently at a hornworm on that borage plant in front of him. 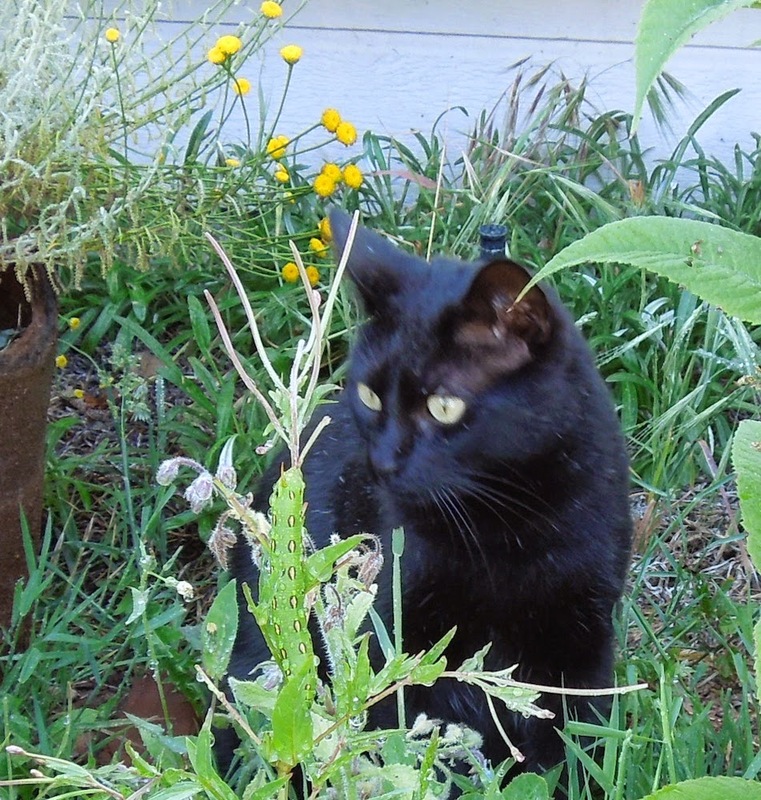 He loves to patrol my garden, but, unfortunately, he also tries to do other business where he shouldn't, so I don't encourage him to linger anymore. Do you have neighbor cats who visit you? Normally birds aren't very easy to photograph. Just as you get close enough to focus they fly away. Not so the sea gull. It seems to have no fear of humans, and, instead, considers them a food source. They are also very greedy when it comes to their food. I remember one day I was at a beach and I had a closed jar of peanuts in the sand. A group of gulls approached it as I watched. The dominant bird started to peck at the jar. It finally became frustrated at not being able to get at the nuts. But it would not let any other bird approach the jar. The dominant gull stood guard and chased any other bird who started toward it. It couldn't get those nuts, but wanted to make sure no other bird had a chance at them either. 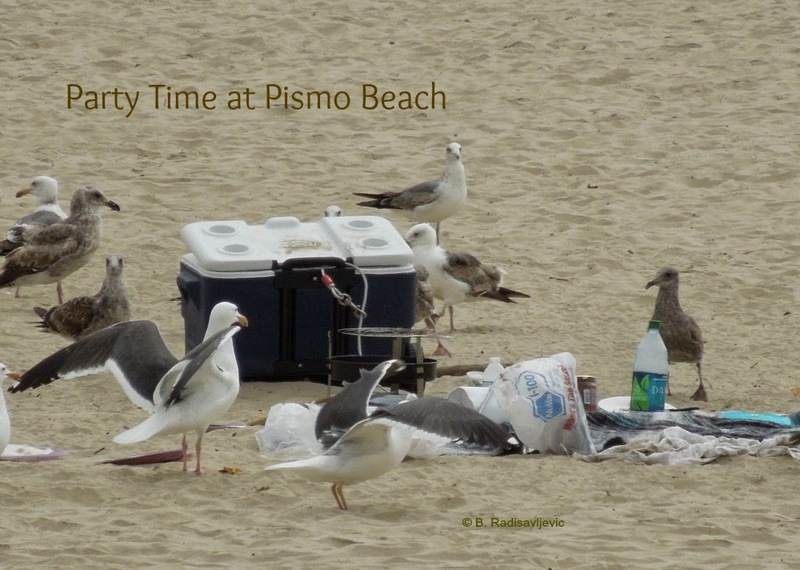 Another day years later I was walking along Pismo Beach past a picnic abandoned for the water. The ice chest and remains of the picnic were still there, so the gulls took over. As I watched, they fought over anything they found. 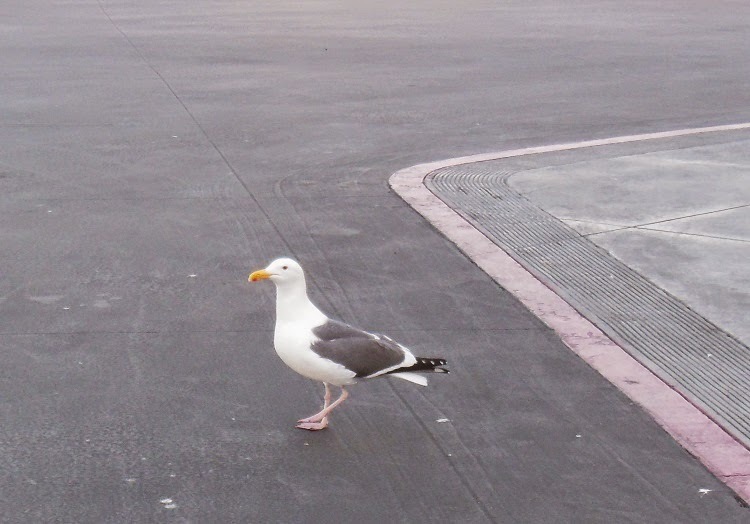 Most wild birds seem to fear people and cars, but sea gulls don't. You can practically run over one before it will move out of your way on the road. The only thing I can't figure out about the gull in the top photo is why he's crossing the road into the parking lot, away from the people eating in the food service area. Just why is the sea gull crossing the road? Follow Barbara Radisavljevic's board California Central Coast Beaches and Towns on Pinterest. What Sort of Owl Is That in the Oak Tree? Most of my discoveries come when I'm on a photo walk. That's how I found this owl. At first, I didn't even notice it. I was parking my car by the side of Linne Road to photograph the oak tree. 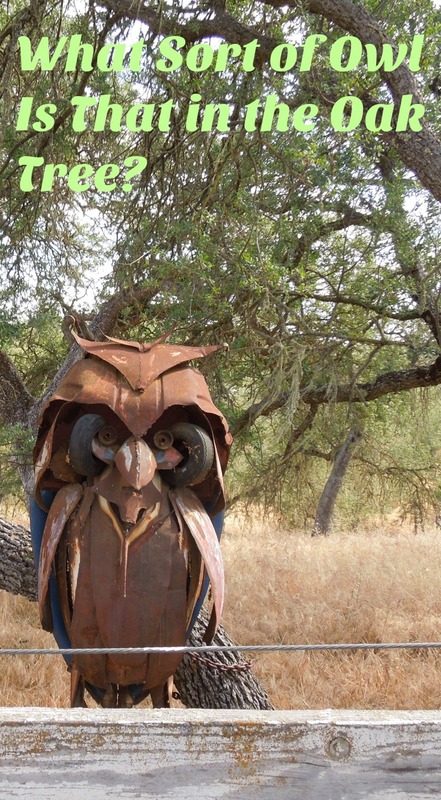 Then I saw something strange when I got closer, and it turned out to be this owl sculpture standing in the tree. I couldn't resist snapping this close-up picture of it. The tree on which this owl stands is worthy of its own picture. It is a marvelous oak tree - so large it won't all fit in the photo. Behind it is a forest of its fellows. I was thinking what fun my son would have had climbing such a tree. Have you ever seen such a sculpture in a tree? 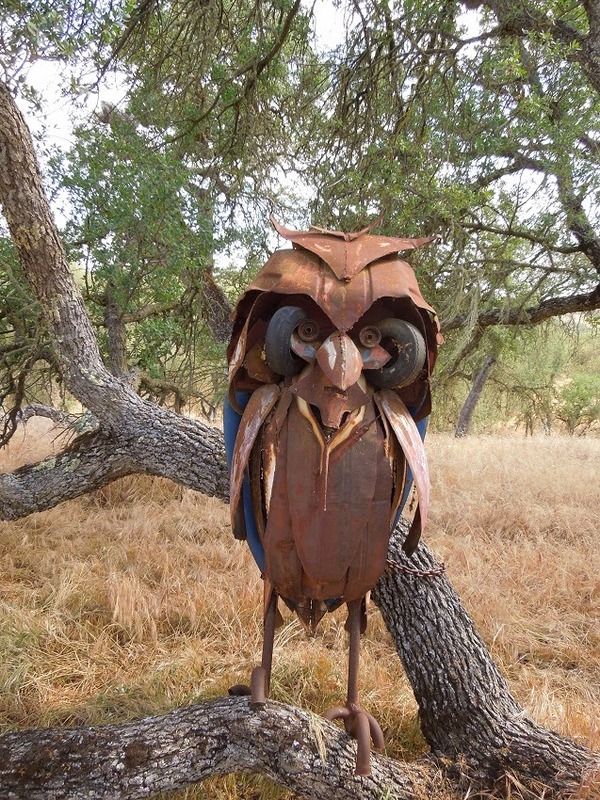 Some owl sculptures are designed to keep yard pest away. Others just add interest to a tree branch. Which do you need? I took the scenic route from Paso Robles to Templeton today so I could photograph the spring vineyards in their green outfits. The route I took from Paso Robles was from South Vine north on Kiler Canyon and then a left on Arbor Road where they intersect. This route leads through a rural residential area, past vineyards and wooded areas, and finally ends on Highway 46 West beside Summerwood. 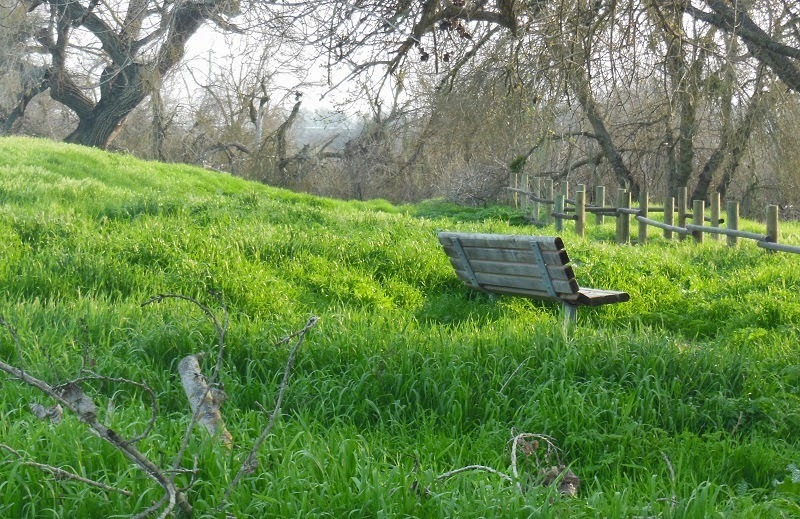 This spot is just north of the Summerwood tasting room. For that reason, I believe these vineyards are part of Summerwood. I don't see any other tasting room on this side of Live Oak Road, but I suppose someone else might own some of these acres. I see there is some new construction going on near the large tree. Unfortunately, I've no idea yet what they are building there. Part of me hates to see buildings going up in the middle of acres of grape vines, but I can see why someone might want to live there or build an outbuilding related to the vineyard business. If you click to enlarge the photo to full size, you will better see the tree that interests me most -- the little one on the horizon. I've been watching it for years. What used to be half of it is missing. I call it the survivor tree. I made this key chain long ago, as it looked when I first noticed it, to honor its will to keep growing, even though part of it is gone. If you look closely at the key chain and compare it to the photo, you can see this little tree is making some progress as new leaves cover the what's left of the lost branch. The key chain is a bit more dramatic because I took the photo it's made from on a stormy day just after a rain, at dusk. 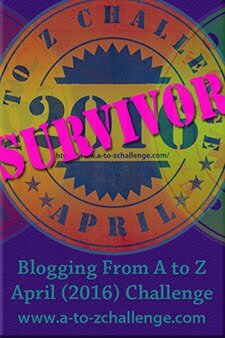 Keychain-Oak Tree, I'm a survivor! I first discovered Dale Evers when I was walking by the Paso Robles Library one day and saw his studio across the street. It was fascinating because the outside of it was decorated with fantastic and imaginative metal sculptures. I can't find those first photos at the moment, but a few months ago I walked by the studio again and this caught my eye. 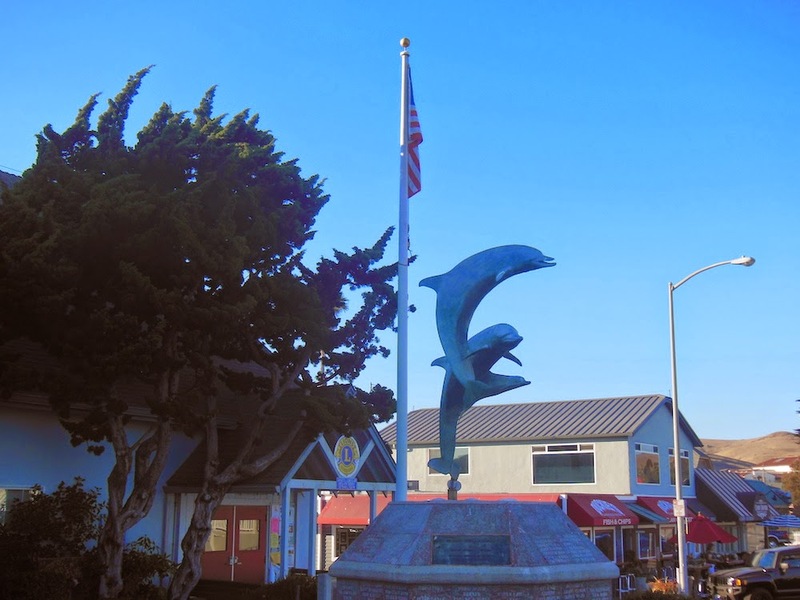 On another occasion, my husband and I paid our first visit to Cayucos. Near the entrance to the pier we saw this sculpture. Then I read the plaque beneath it and discovered Dale Evers had created it in memory of his father, Ellis W. Evers. You can enlarge any of these photos by clicking on them. Since then I have been discovering how diverse Dale's work is, and how far away some of it has gone. The Dale Evers Website will show you much more about him and his work than I can here, but it's well worth a peak if you like sculpture. 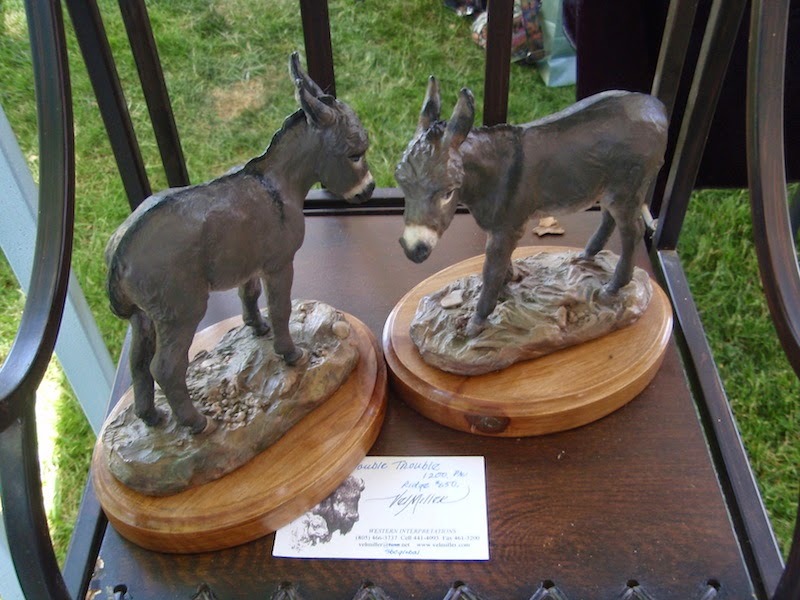 The last time I saw Dale's work was on July 4, 2014, at a party at Sculpterra Winery. I hadn't realized then that Dale Evers was the new artist in residence at Sculpterra until I saw this sculpture near the tasting room and the style looked very familiar. Sure enough, it was Dale's work. This also looks exactly like the sculpture that lived next door to me in the ZinAlley Vineyard for a long time. It is not there anymore, so it may have been moved to Sculpterra. Are you familiar with Dale Evers' work? Why the Tent in the Park?